I adore the packaging for these as it's vibrant, eye-catching and sleek. Inside, the actual lipstick has this unique almost tear drop shaped bullet, which is designed for a more easier application. Upon application, these glided on like a dream! First of all the unique shaped bullet made them so easy to apply and secondly, these were so richly pigmented that one swipe is all you really need. The lipstick does dry down pretty quickly to a velvety matte consistency, which doesn't look drying at all. I found these so comfortable to wear and not drying at all. I tested out Hyppink Chic and Brunette for longevity and both stayed on the lips for a good 8 hours. I did get the tiniest bit of transfer but nothing major considering how pigmented these are. For the brighter colours, I would advise popping them in your bag as the colour can fade slightly through wear and tear. 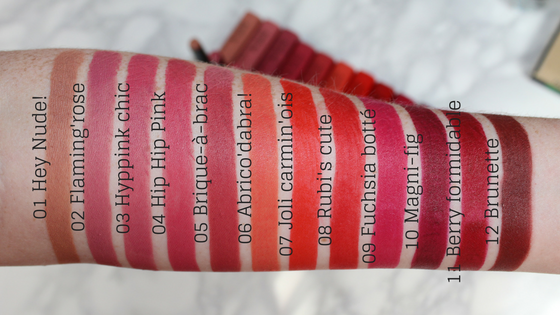 Having never tried much from Bourjois lip range before, I was suitably impressed by not only the quality of these lipsticks but the pigmentation, colour selection and wearability. Yes, they are a tad more expensive than your regular drugstore lipstick, but hey I think the price is completely justified because of the many qualities these lipsticks house. The shape of the lipstick bullet is rather unique but perfectly formed to aid in the ease of application and the overall feel of these lipstick considering the formula is matte is so comfortable to wear for long periods of time. I also love the fact that all 12 of the colours are totally wearable and suited to anyone and everyone. So if you're after a more premium drugstore, semi-matte lipstick that's long-wearing, pigmented and enjoyable to wear, then I would for sure recommend checking this collection out. *These were sent to me complimentary for testing but as always all opinions are my own.